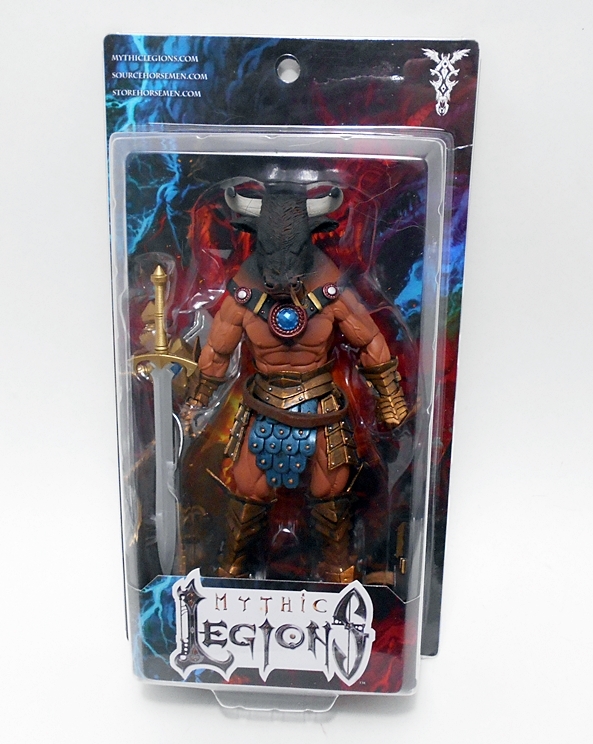 Oh, how I look forward to Wednesdays now, when I can sit back and bask in the glory of yet another Mythic Legions figure from T4H. Today I’m checking out one of the more unique figures in the line. 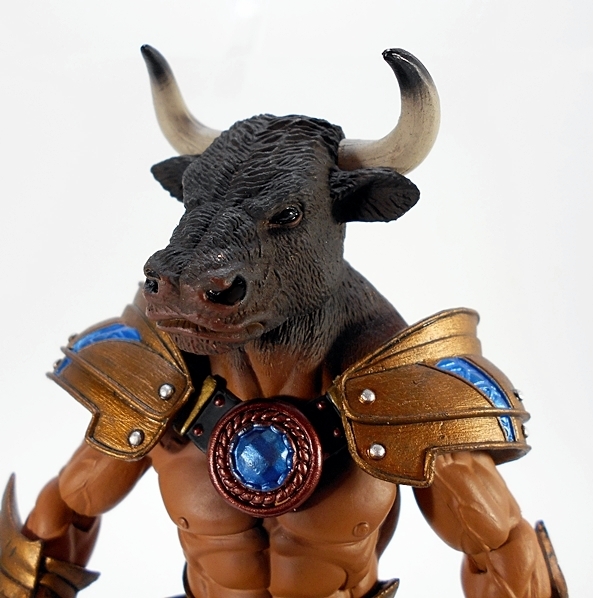 His name is Asterionn, and he’s a god damned Minotaur! And he’s one of the good guys! I’ll continue to show packaged shots of these figures even though by now y’all should have a good idea of what to expect. It’s a simple and collector friendly bubble and card with an insert showing the name of the series on the front and a blurb about the character on the right panel. Slide out the card and you can get at the goods. It’s worth mentioning here that Asterionn is the one and only figure in this line that had some paint rubbing on the inside of the bubble from his nose. It’s not even noticeable on the figure, but the smudge is clearly visible on the bubble. That protruding snout just doesn’t have anywhere to go in the package, so it just ends up rubbing on the inside. 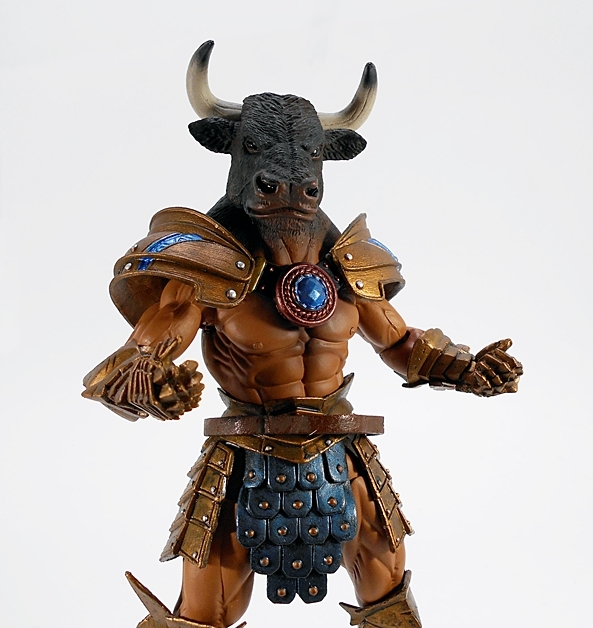 As usual, the figure comes packaged without the shoulder armor attached and in this case it gives us a nice look at the unique sculpting in the area where the fur from his bovine head gives way to man flesh. This part is cleverly done as the entire area from the chest medallion up to the neck is a separate piece fitted on top of the standard bare chested buck. 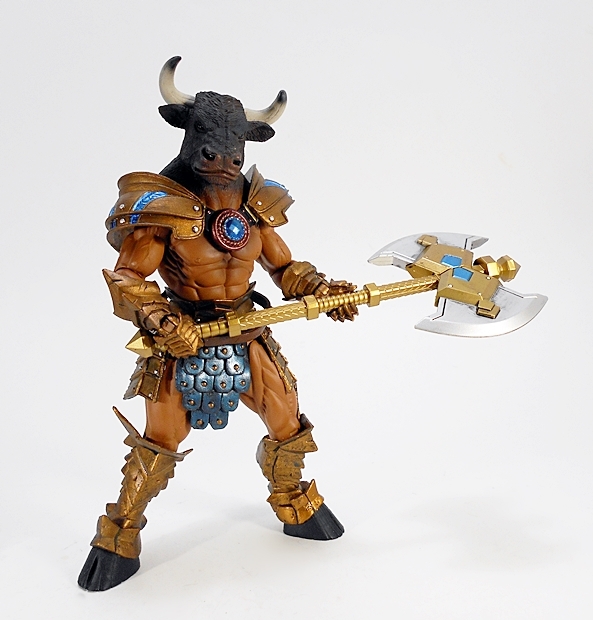 That buck, as well as the upper legs and upper arms, are the same parts used for Urkku and Vitus. 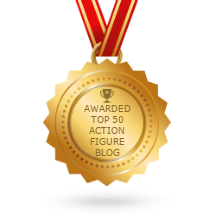 The parts reuse means that Alterionn features the same excellent standard of articulation as the previous figures in the line, which basically means you get rotating hinges all around and each of those hinges is a point where the corresponding part can be pulled off and swapped out with one off of another figure. We saw the waist, hip, and groin armor back when I looked at the Dwarves, Thord and Bothar. Yes, the armor pieces used on the Dwarves work perfectly on this hulking dude. Proportionally, it shouldn’t work but it does. How cool is that? 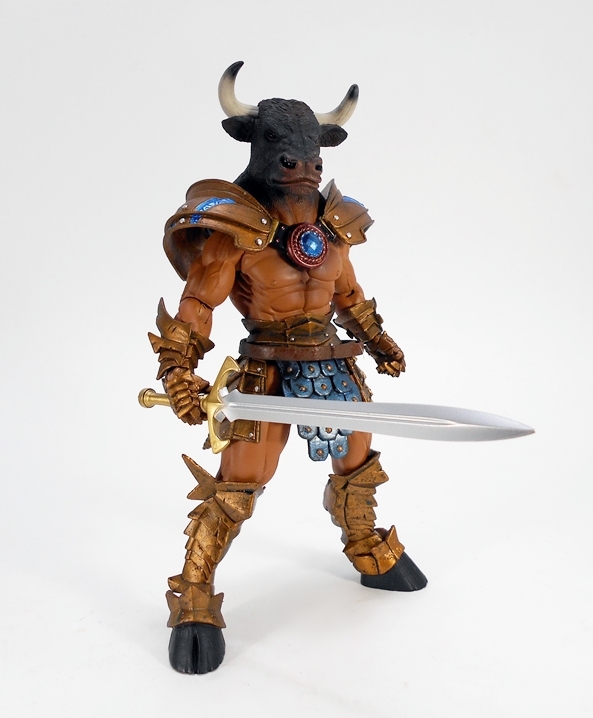 The shoulder armor consists of the same molds we first saw on Sir Gideon and both the gauntlets and grieves are repaints of the same pieces worn by Urkku. Asterionn does feature a new set of hooves for feet. And yes, you get the standard brown belt, which can be used on the waist or as a shoulder strap. The paint on Asterionn is just as fantastic as what we’ve been seeing all along. 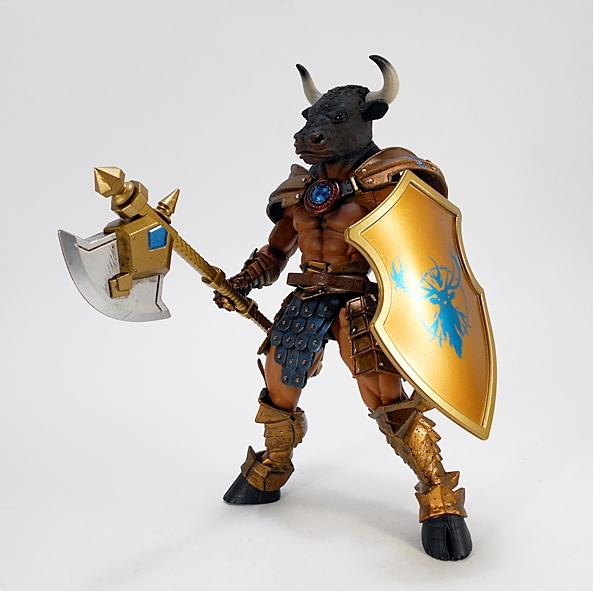 The armor pieces feature a very nice worn copper look with silver painted rivets and metallic blue scales over the groin, each with a neatly painted copper rivet. The same blue is used for the stone in the center of his chest medallion as well as some striking accents on the shoulders. The portrait here is brand new and it is absolutely killer. 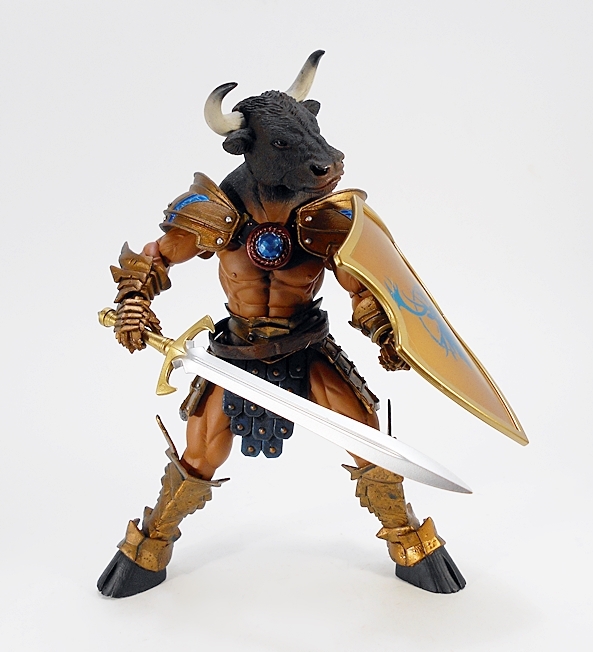 The powerful bull head features some excellent sculpted hair and the glossy paint used for the eyes give him a delightful spark of life. 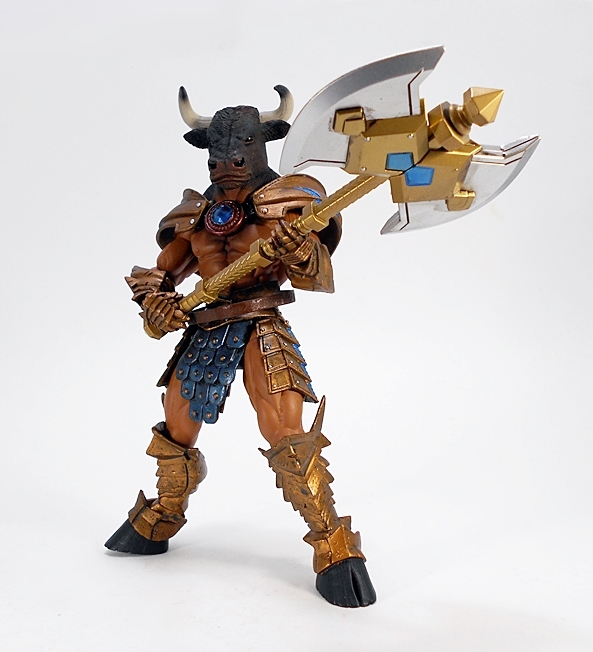 The horns can be rotated or even pulled out and used in one of the other figures’ helmets. But I wouldn’t want to deprive this guy of his horns. I really like the deep chocolate brown paint they used on his head and the way it fades gradually into the skin tone. Asterionn comes equipped with the standard shield that we’ve been seeing a lot of. In this case the surface features a blue stag head against a gold background. 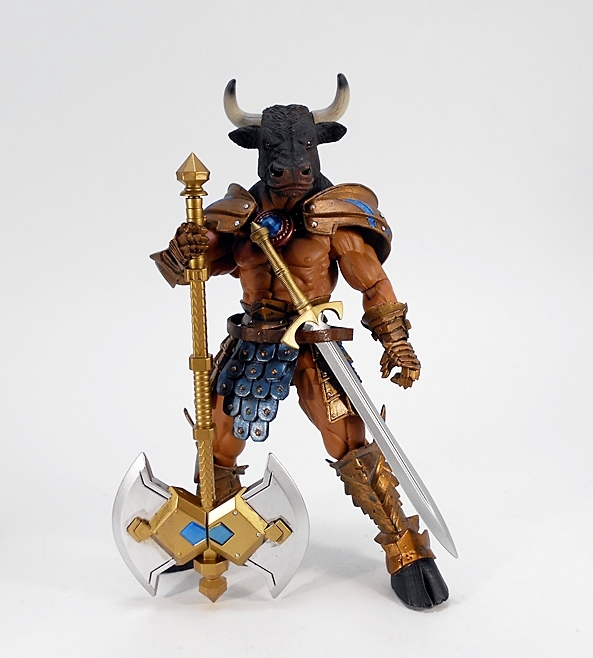 You also get the sword that we’ve previously seen included with Gorgo, Urkku, adn Bothar. 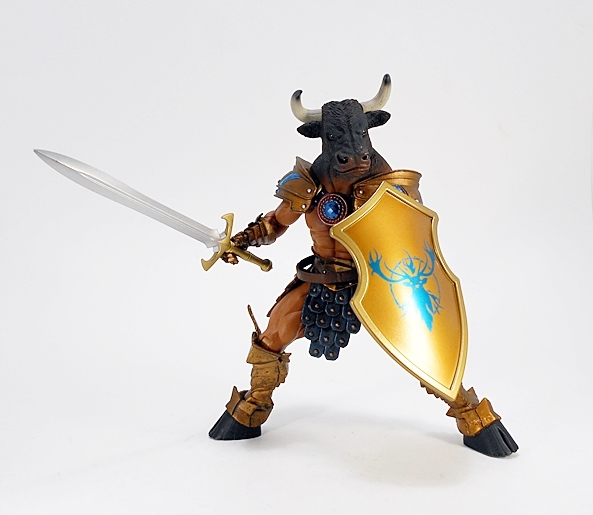 This time it has a gold painted hilt, which matches the gold rim on the shield. And finally, you get the axe that we’ve already seen a couple of times and which can be displayed with either a single or double blade. 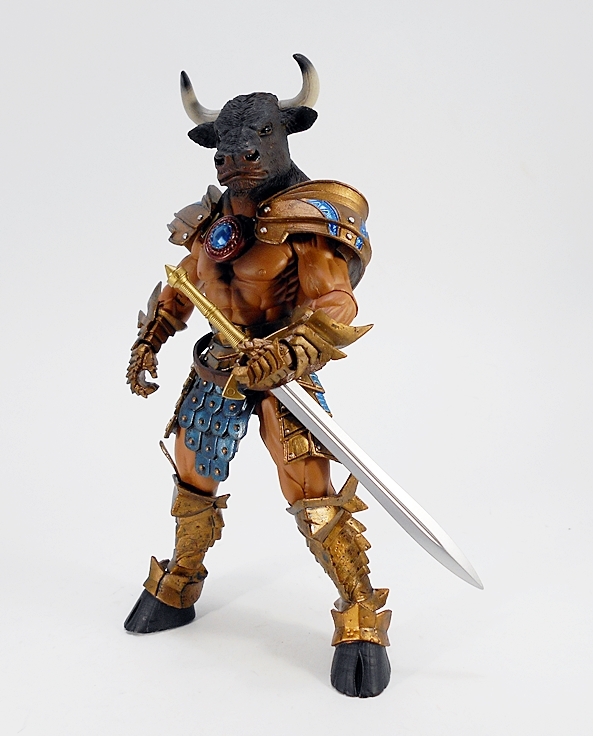 This one is decked out with gold, silver, and blue paint to match his armor. There’s also a cool weathering effect on the blade. 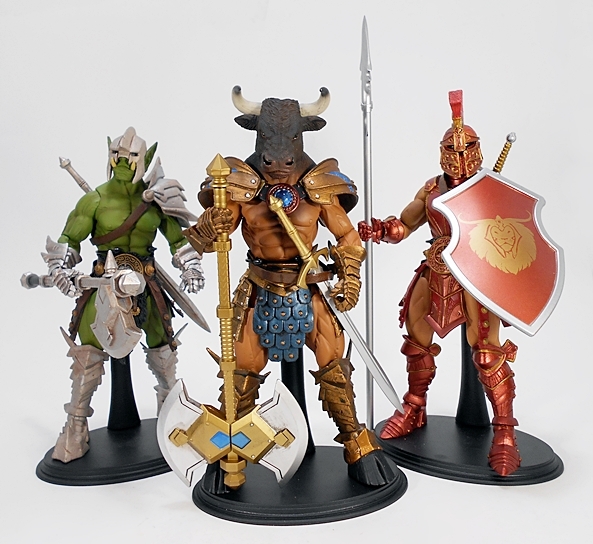 I’m really trying not to fall into the trap where every time I look at a new Mythic Legions figure, I proclaim it to be my new favorite, but that’s been more or less the case. I really do love everything about this guy. 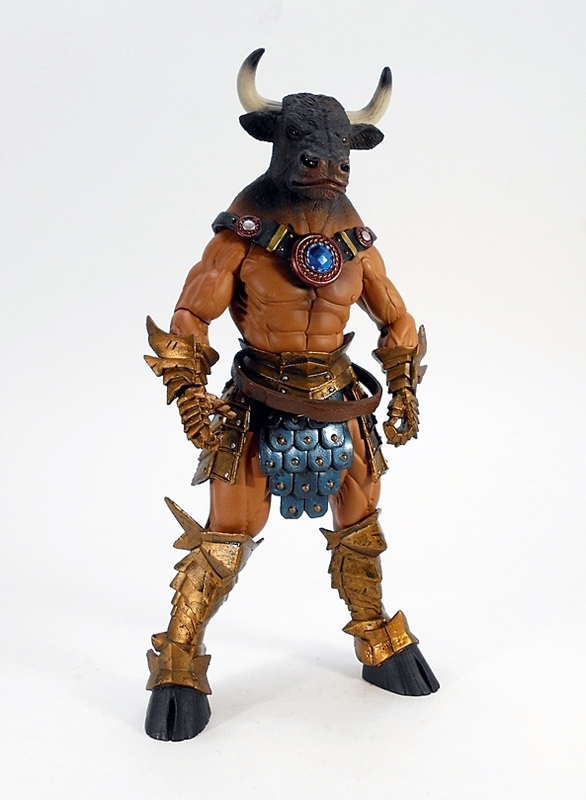 Having a Minotaur in the line is a perfect fit and while I confess that I haven’t been investing a lot in the fiction for the line just yet, I do like that they made him a good guy. Asterionn is a gorgeous figure and yet another fine example of how well T4H planned out the parts sharing in this line. 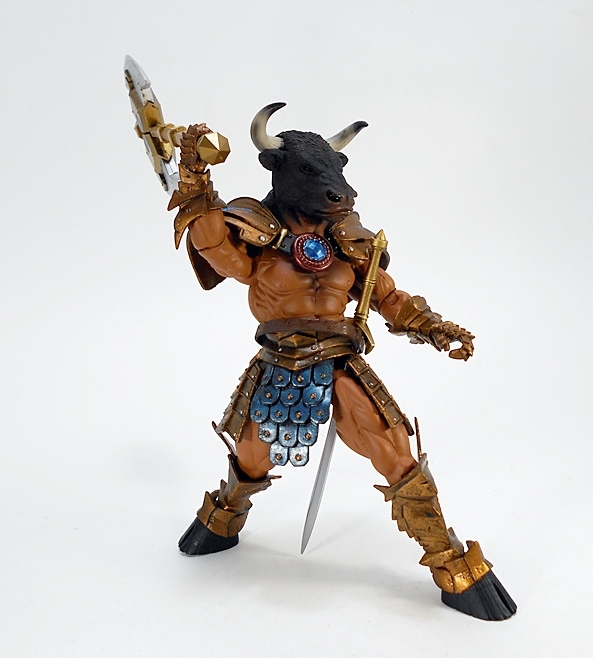 There’s another Minotaur coming with the Wave 1.75 figures, but I decided to stick with this one. He’s more special to me if he’s the only one of his kind, and quite frankly I think they nailed this figure so well, I didn’t see a reason to add another.